I remember my first anniversary. My girlfriend surprised me with the announcement that we had been together for six weeks and it was time to celebrate. Then came the three-month anniversary. And the sixth. We didn’t make it to a year. I blame all the damn anniversaries. Well, not really… but it’s true. After a while Anniversaries can be a bit of a chore. But not for cigar makers. It seems like nearly every manufacturer has a few Aniversarios in their portfolio these days, and Casa Fernandez is no exception. As a brand name, Casa Fernandez is fairly young, but the company has old roots. 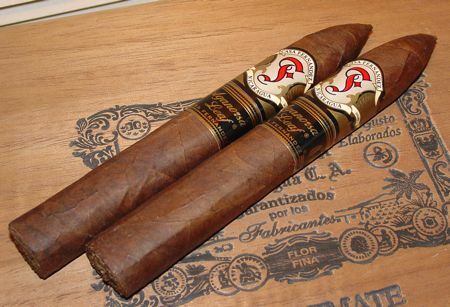 The business that would become Casa Fernandez began as Tabacalera Tropical in the 1970’s. Eduardo Fernandez had already been operating Aganorsa for a few years when he purchased Tropical from Pedro Martin in 2002, but with Arsenio Ramos employed as a blender using Aganorsa tobaccos, the cigar maker emerged from the shadows of the shade cloth. So I think it’s safe to say that the anniversary this cigar celebrates is not so much a founding of a finished product as the beginning of an evolution. Because this blend utilizes aged tobacco they may not have needed the bonus humidor time that I usually afford Casa Fernandez cigars, but they’ve been cooling their heels at 65% for almost a year anyway. The Casa Fernandez Aniversario is a handsomely appointed toro, complete with the super premium accoutrement: a tasteful white band, a silver anniversary band, and a parchment sleeve etched with the company logo. All it’s missing is a black tie. The wrapper is a smooth milk-chocolate colorado claro with subtly dimpled veins. The head is perfectly symmetrical and topped with a clean flat cap. The cigar has a slight box press which has relaxed a bit after resting loose in the humidor. It draws well, burns evenly, and produces a nice volume of smoke. The ash is a solid light gray. The only construction flaw I encountered is that the wrapper, despite its beauty, is somewhat fragile and has a tendency to split. Careful storage and optimal atmospheric conditions are recommended when lighting up. Cocoa jumps out at the first puff and stays in the driver’s seat for the whole ride. Some sweetness enters on the palate, rendering caramel after an inch or so. Some woody notes are present in the first half of the cigar which veer into earthy territory in the second. The smoke is smooth, a little dry, but never heavy. Some pepper shows up toward the end, but that’s about it for spice. This toro is very easy to smoke, but it lacks the development that I expect in a cigar of this magnitude. Unfortunately, this blend lacks the complexity that veterans might expect in an Aniversario. (Compared with the Padron Anniversary blends, let’s say.) And of course there is the price. At $12.50 a shot it has some serious competition. All things considered, I still think it’s worth it. According to Richard Hacker’s Ultimate Cigar Book, the first Rothschild cigar was produced by Hoyo de Monterrey in the late 19th century in response to a request from the London-based financier, Leopold de Rothschild. He wanted a short cigar with a large ring gauge that would smoke like a full-sized cigar, but in a shorter amount of time. Since then, many cigar makers have produced cigars in this size, though stumpy cigars have often been assigned the moniker “Robusto” instead. Nevertheless, the Rothschild persists — sometimes as Rothchild, or Rothchilde, or in the case of Illusione’s entry: Rothchildes. Due to their power and wealth, the Rothschild family has been the target of numerous conspiracy theories over the years, from currency manipulation to presidential assassination. And as we know, the Illusione mystique relies in part on the shadowy world of conspiracy theory. Therefore we should ask the question: why the misspelling? Why Rothchildes, and not Rothschilds? What is the significance of the missing S, and the added E? Is there a hidden meaning? But we also know that the Illusione mystique does not rely on conspiracy theory alone; it also relies on premium quality Nicaraguan tobacco, specifically Aganorsa tobacco. This quality is apparent from the first puff on the *R* Rothchildes, and the flavor is quintessential Illusione. The binder and filler leaves are Aganorsa grown, and the wrapper is a nicely processed maduro leaf from the San Andres Valley of Mexico. The Rothchildes are rustic in appearance with rough maduro wrappers and single caps slapped on heads that are sometimes a little uneven. The throw-back bands blend well with the rough appearance of the wrappers. The roll is solid, though the cigar feels a little light — perhaps it’s this desert winter air, the nemesis of my humidor. But any worries about underhumidification are dispelled by a draw that offers the right amount of resistance and an even, steady burn. The first third of the cigar is marked by the clean crisp flavor that is Illusione’s stock in trade. Hardwood smoke with a cherry edge. If I didn’t know what this cigar was and had to guess, I might have to say La Riqueza. A peppery spice builds as the cigar grows in complexity. The flavor on the palate gradually loses its crispness and becomes earthier, and the cherry on the nose transitions to cocoa. In the final stretch the cocoa loses its sweetness and the earth turns darker and sharper; the smoke bites a little, but doesn’t bitter. The Rothchildes bear more than a passing resemblance to the veteran blends in the Illusione family: the clean woody flavor of Aganorsa tobacco is prominent and distinguishing, and the subtle cherry flavor that appears in the first section is an unexpected bonus. And while they’re not quite as complex as the pedigreed Original Documents, they have a particularly redeeming characteristic: a price tag under $5 USD. A tall price is frequently an indicator of premium quality, but it’s not a requirement, as Illusione *R* Rothchildes ably demonstrate. Sindicato is a clever name for a cigar — it has that underworld overtone, that slightly sinister suggestion of menace that is so common in cigar marketing these days. But the name is a classic red herring. Sindicato has nothing to do with the mob — it’s the Spanish term for a labor union. Leave the gun. Take the chaveta. Sindicato Cigars are made by a union of cigar industry veterans: retailers, manufacturers, lobbyists, the whole kit. Their motto is “Join the Union.” After smoking a couple of their flagship brand cigars, I believe I will. 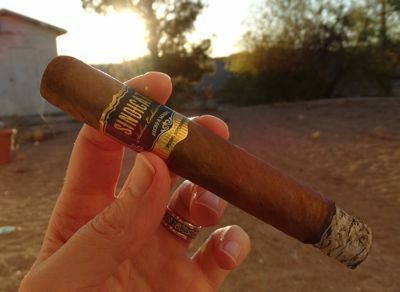 Sindicato is a Nicaraguan puro blended by Arsenio Ramos. The cigar is made in the Casa Fernandez factory, so it should be no surprise that the wrapper is a shade-grown Corojo leaf grown on the Fernandez farms in Jalapa. Under the hood is a double binder from Esteli and a filler blend of leaves from Jalapa and Esteli. I will openly confess my weakness for Jalapa tobacco, and I’ve been a fan of Aganorsa leaf from the early days of Tabacalera Tropical, so I was stoked to fire this one up. The Corona Gorda is a square pressed cigar with a soft and supple milk-chocolate brown wrapper. The cigar feels light in the hand, but it’s packed well and burns slowly. The foot is unfinished (flagged) and the head sports a tight pigtail cap. The draw is excellent, producing a consistent volume of medium-bodied smoke, and the cigar burns evenly. This is a handsome cigar, obviously rolled by experts. The Sindicato Corona Gorda is a medium strength cigar with notably aromatic complexity. The cigar starts out as smooth as its silky wrapper leaf and never gets harsh. Initial flavors are of roasted nuts with a dash of black pepper, but the aroma steals the show. It’s too complex to call it cedar –it smells to me like sandalwood. There is a sweetness to the scent that complements the flavors on the palate, a nutty brown sugar sweetness that grows earthier and more peppery as the cigar burns. The finish is lengthy, and though it becomes fairly spicy in second half it stays smooth to the end. Sindicato is an elegant and extraordinary smoke. I haven’t seen anyone do a flavor map for this cigar yet, but if I made one it would cover the whole spectrum. Everything from wood to pepper to floral scents — it pretty much made my palate light up like a Christmas tree. It’s smooth and sweet, very easy to smoke, and never boring. It’s one of the best new cigars I’ve tried in a long time. Just one catch though, and you knew this was coming. You don’t get to join the Union without paying your dues. While the price is not exactly prohibitive, it is still considerable. The Corona Gorda runs around $10 USD, with larger sizes commanding commensurately larger fees. And you won’t find these in the discount aisle anytime soon, or ever, so save up your shekels. It’s a worthy investment. Padilla’s Artemis series is the first box pressed cigar for Padilla, but just about everything else about it is quite familiar — it’s a Nicaraguan puro utilizing Aganorsa tobacco, and it’s made at the Raices Cubanas factory in Honduras. Those are enticing details, and enough to get my salivary glands going. Artemis uses Cuban-seed criollo and corojo from Nicaragua’s now-famous Aganorsa company, a tobacco grower affiliated with Casa Fernandez cigars. The line was originally released in 2011 as a brick-and-mortar exclusive, but it now appears to be available online as well. The wrapper is a dark colorado maduro with a moderate amount of oil. Both sizes had an accessible draw, and the box press didn’t seem to have much of an effect on the performance of the cigar. But I experienced a burn problem with the double torpedo that I didn’t with the robusto, and it wasn’t the irregular burn that is the hallmark of many box-pressed cigars. This was a more serious problem that affected the taste of the cigar — the wrapper would not burn in sync with the binder and filler, resulting in a flavor that was at first merely tepid, but quickly made it hot, bitter, and unbalanced. For this reason I’m going to focus on the robusto and not the double torp. Overall construction: Very good for the robusto; Needs improvement for the double torpedo. If you’re familiar with the Padilla 1932 or some of the cigars from Casa Fernandez you’ll recognize the flavor of Aganorsa tobacco. It’s a little different in the Artemis, but it’s there. The first notes are of leather with some sweetness and a little bite. The aroma is slightly fruity, but also reminiscent of hardwood smoke — something like hickory, perhaps. After a minute or two the pepper begins to build on the palate. The mid-section is earthy but a little sharp. The flavor isn’t quite as clean as Illusione’s “original document” line, but it has that crisp minerally tang which is Aganorsa’s trademark. The final inch and a half is rich and powerful in flavor, though the cigar is still medium-to-heavy in both body and strength. The last section bottoms out a little as the spice takes over and edges out the subtle notes on the nose. Fans of Padilla and Aganorsa leaf will probably enjoy the Artemis, though perhaps not as much as some other blends that employ that particular leaf. The flavors are quite pronounced, and in the robusto were well balanced up to the last third of the cigar. I was more than a little disappointed in the double torpedo, but I would probably pick up the robusto again at the right price. The right price for me is a little south of the MSRP, which is in the 9 to 10 USD range. To be honest, Padilla has already provided this cigar’s competition in the Padilla 1932, and in that contest the winner goes to the elder blend. Due to a memory error in my camera I lost my cigar-in-progress photos. I know you only come here for the articles, but my apologies anyway. My original intention in trying more cigars from Tabacalera Tropical was to find a less expensive but comparable alternative to the Nicaraguan puros that I smoke on a regular basis. The name Aganorsa kept popping up, and I thought that by following the trail of that grower’s tobacco I might find cigars of a similar style, possibly at a lesser price. Since cigar makers like Pepin Garcia, Dion Giolito, and Ernesto Padilla have all at one time or another used Aganorsa leaf in their blends, I expected that Tropical’s blends would at least have a passing resemblance to smokes like DPG’s Cuban Classic, Illusione, etc. Their JFR cigar certainly does. I was a little disappointed to find that Lempira Fuerte and Condega didn’t live up to my expectations, though I still thought Condega was a very good blend. Particulares, on the other hand, is a great cigar, and it is the first in the series so far to really taste like it’s in the same category as the Big Nicaraguans I have been using as a benchmark. Particulares is an old Cuban brand name (as well as a frontmark for the Cuban Hoyo de Monterrey “A” size) but the name was revived by Tropical as one of their first brands. (Their very first brand was Solo Aromas, followed by Particulares, Cacique, and Maya.) And even though this appears to be the only formulation available it is listed with its royal appellation “Reserva Privada” in some online catalogs. I didn’t notice it immediately but it turns out these sticks have pig-tail caps. The tail is curled and pressed down into the head so it just looks like a small swirl. It can be easily prised up with a fingernail, though admittedly there isn’t much point. The rest of the head is wound perfectly into a fine triple cap. The wrapper is somewhat rough but consistent in color, a dark colorado maduro. The band features a lock-and-key motif that “locks” at the point where the band ends meet — a clever design, I think. The draw is good and the burn is slow and even. The ash flakes slightly, but not enough to matter. Overall excellent construction. 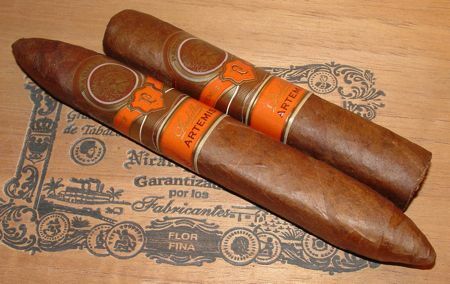 The Particulares robusto starts up with a rich hickory-like aroma that is immediately recognizable. This is what I’ve been looking for. From the first puff this cigar tastes more like an Illusione or Padilla than the Lempira Fuerte or the Condega Corojo. The flavor is a little charred, but not in the way that the Lempira was. The flavor is closer to grilled meat with some maple syrup-like sweetness. The middle section continues in this vein but softens up a bit — it’s smooth with some fruity notes, almost brandy-like at times. It reminds me of the JFR cigar, but smoother and more refined. The last third is spicier but still sweet. The finish lengthens, but it doesn’t settle in for the night like some cigars do after the mid-point. It stays clean and crisp and leaves in a reasonable amount of time, like a good guest. The aftertaste gets a little tarry at the band, but by that time this cigar has said its piece. The Particulares robusto is a tasty smoke that finally delivers on the flavor I was expecting from Tropical – Aganorsa. The only hitch is that it isn’t much less expensive than Illusione or Padilla or others in that class. Prices range from 6 to 7 USD. That’s not too much to ask for a cigar of this caliber, but I was hoping to tap a secret source of Nicaragua’s finest and save myself a bundle. But I really have no legitimate reason to be disappointed — it’s still a great smoke at a reasonable price.